I may be cheating with this because I've done a recipe like it before, almost 3 years ago. However, my birthday was on Saturday and I made myself an ice cream cake. I would prefer to share something ice cream/mint/cake-related on the Monday after my birthday. Much more interesting than the soup I originally had scheduled for today. Plus, it's Monday. Ice cream might be necessary. I did improve upon this recipe. And I added cake. Because there were a few of you up in arms over the idea that my Peppermint Oreo Ice Cream Cake did not, in fact, have cake in it. That's just how we do ice cream "cake" in this house, guys. You can put away your torches and pitchforks…this one has cake in it. Actually, it's a brownie. But, it was easy to make and I'm not a cake person and I didn't want to use a boxed mix anyway. You can use whatever kind of chocolate cake/brownie you want and just cut it or arrange it to fit your ice cream cake pan. I used this recipe, omitted any frosting, and added a teaspoon of peppermint extract. Food on birthdays is really important to me. I feel you should treat yourself all day long on your birthday. When I started thinking about a cake, I knew it needed to be the ultimate version of Kristin's Favorite Dessert. My favorite dessert ever is the Mint Oreo Concrete Mixer from Culver's Frozen Custard. I had one on New Year's Day and it was the best part of Christmas Break. I swear. If you haven't had mint Oreos mixed into artificially dyed mint ice cream, you haven't lived. 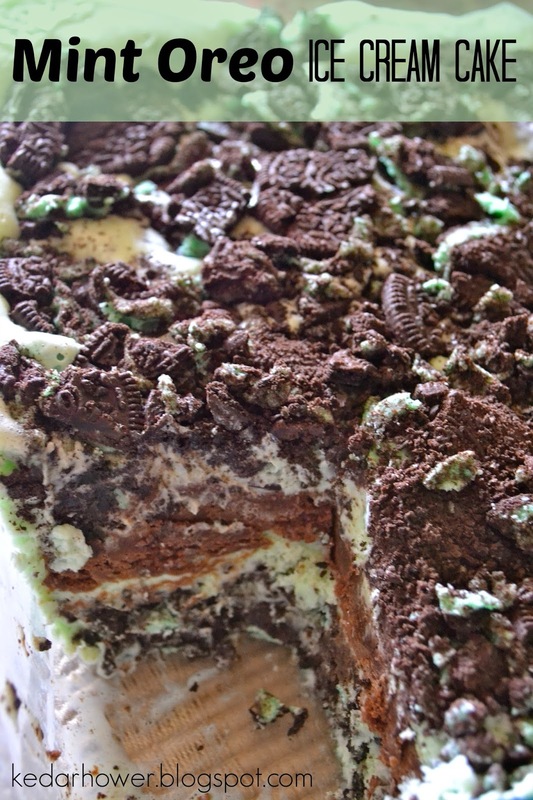 When I made this first version of the mint ice cream cake in 2012, my inspiration was Thin Mints and I was still living in Alaska so I'd never even tried a concrete mixer. This time: real mint chocolate brownie, mint Oreos, and mint ice cream. This was the perfect birthday cake. Crush all the Oreos in a Ziploc bag. Mix half of them with the melted butter, and press those into the bottom of your pan. Freeze for 20-30 minutes. Spread half the ice cream over the Oreo crust and then press in the brownie/cake pieces. Freeze for another 15 minutes. Top with the rest of the crushed Oreos, cover, and freeze until ready to serve. I usually make it the day before. Take it out about 15 minutes before you're ready to cut the cake. You can also use Cool Whip as another layer if you'd like. This isn't a 30 minute dessert. I baked the 8x8 brownie earlier in the week, but I put this all together while I was cooking dinner on Friday night. It didn't take very much brain power or energy. It's just a process. To me, ice cream cakes don't have cake in them. They have two separate types of ice cream and some little crunchies on top. OH YUM!! I love mint and chocolate anything! I may need to make this my birthday cake this year! I knew we were friends for a reason. Food is HUGELY important to me especially on my birthday. I feel like every bite I take on that day should be super special! And Chocolate mint (especially mint chocolate chip ICE CREAM) Is my all time favorite in all the land! This might have to be my bday cake this year! I swear, this will be Jordan's birthday dessert if I show it to her! !